Numerous individuals attended the Republican Party Bean Dinner last week at the Mulberry Community Center. 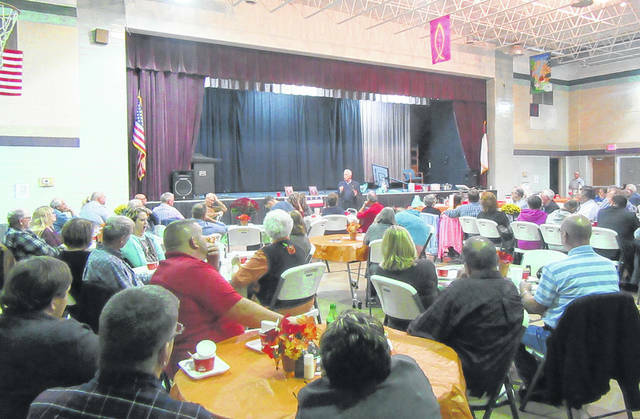 Congressman Bill Johnson addressed supporters at the Meigs County Republican Part Bean Dinner last week. 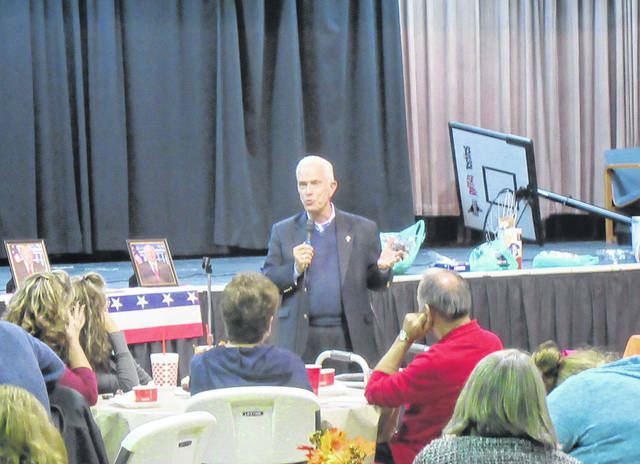 POMEROY — Congressman Bill Johnson (R-Marietta), who is currently seeking his 5th term in Congress, addressed those in attendance at the Meigs County Republican Party Bean Dinner on Thursday evening at the Mulberry Community Center. “Vote Republican, that is what is important,” said Johnson. He noted that the national media wants people to believe there is a “Blue Wave” coming so that people will feel defeated and stay home. In the 6th District, which Johnson serves, the Congressman noted that 17 of the 18 counties supported President Donald Trump in the 2016 Primary Election over Ohio’s own Governor John Kasich. “We need to keep this momentum going,” said Johnson. “This is a voter turnout election…. Remember to go vote and tell your friends and family, everyone, to go vote,” said Johnson. One of the key themes of the evening was the opposition to State Issue 1. Johnson, State Rep. Jay Edwards, Common Pleas Judge-Elect Linda Warner, Prosecutor James K. Stanley and others encouraged everyone to vote “no” on Issue 1 and encourage friends and family to do the same. “It is vitally, vitally important that you vote no on Issue 1,” said Johnson. He added that Issue 1 plays on the emotions of families of those who have been arrested or are incarcerated, but it does not look at the long-term of where the person may be if they are released. Edwards added that Issue 1 is “particularly scary” in border counties like Meigs. “Your vote counts for the entire state,” said Edwards, emphasizing the importance of getting out to vote on Issue 1 and in the other races. Also addressing the crowd were candidates Tim Ihle, Commissioner; Mike Hess, 4th District Court of Appeals; Jason Smith, 4th District Court of Appeals; Jay Edwards, State Representative; Mary Byer-Hill, County Auditor; Trenton Cleland, County Court Judge; Michael “Mick” Barr, County Court Judge. A representative from the Jim Renacci for U.S. Senate Campaign also spoke at the dinner as did Meigs County Prosecutor James Stanley, who spoke against Issue 1. Local officials not up for election this cycle also introduced themselves to the crowd. https://www.mydailysentinel.com/wp-content/uploads/sites/14/2018/10/web1_10.23-Republican-1_ne2018102210118730.jpgNumerous individuals attended the Republican Party Bean Dinner last week at the Mulberry Community Center. https://www.mydailysentinel.com/wp-content/uploads/sites/14/2018/10/web1_10.23-Republican-2_ne20181022101111444.jpgCongressman Bill Johnson addressed supporters at the Meigs County Republican Part Bean Dinner last week.